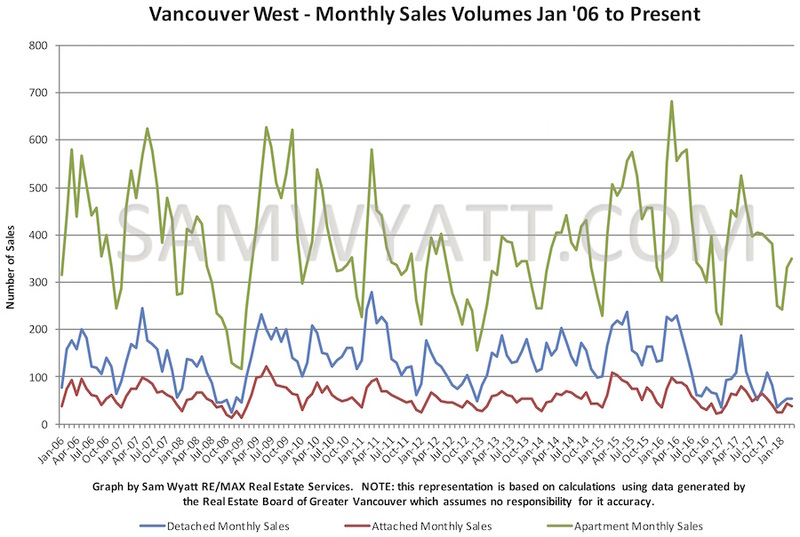 Months of Inventory (MOI*) rose again in March for Vancouver Westside detached homes. It is presently at 14.57 months - the highest it has been in any March for over a decade! Westside house prices are falling. Apartments and attached MOI sit at 2.05 & 4.44 respectively. Even as house prices fall, apartment pricing will likely continue to rise over the next several months. 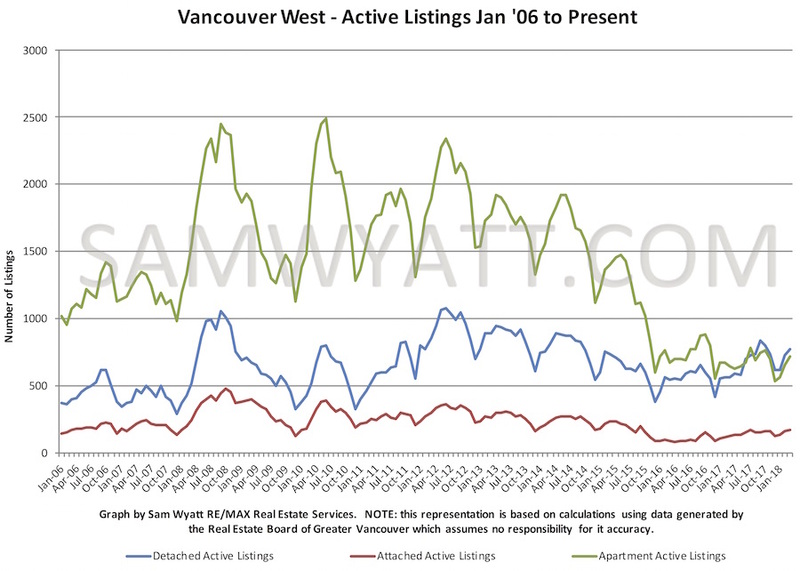 There are still more houses for sale than apartments in Vancouver West. This fact is driving both increasing apartment pricing and falling house prices. 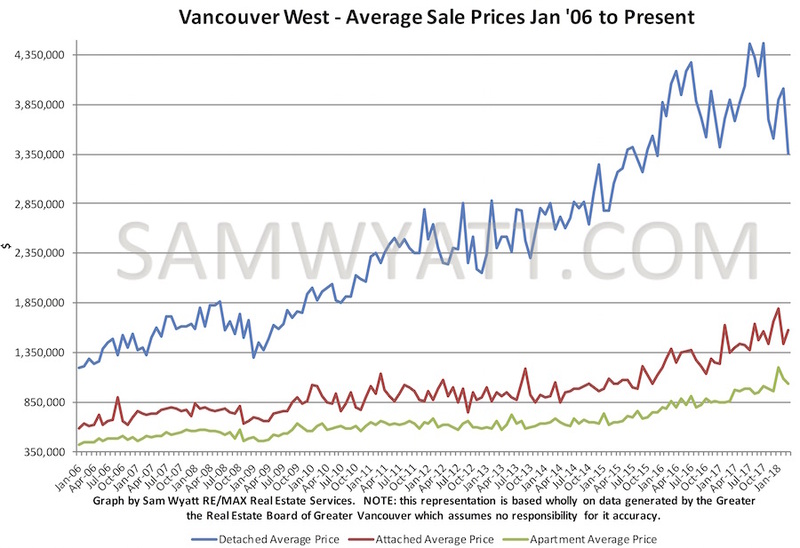 Sales volumes remain ultra-low for westside houses, low for attached homes and typical for apartments. Detached home average sale prices plunged in March to just over $3.352m - pricing not seen since 2015. 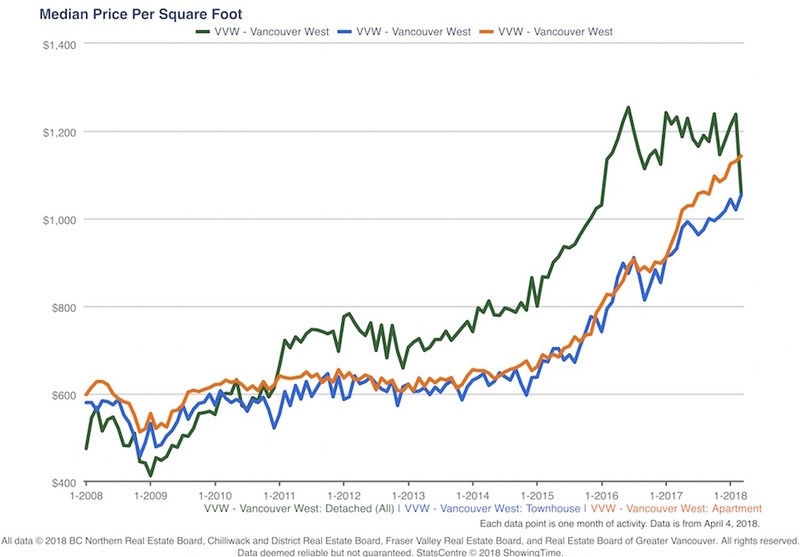 As predicted, the price per square foot for apartments is now higher than for houses for the first time since 2010. This may well be the new normal. The new mortgage rules that took effect in January 2018, requiring borrowers to qualify at 2% higher than their actual lending rate, have likely made the biggest impact on the deteriorating Vancouver house market. New taxation and other measures announced in the BC budget may also be contributing to lower sales volumes for houses. In particular, the so-called "speculation tax", better titled "vacant property surtax" is probably having some effect. With sustained double digit MOI, I expect westside detached homes to continue to see price decreases over the next several months. 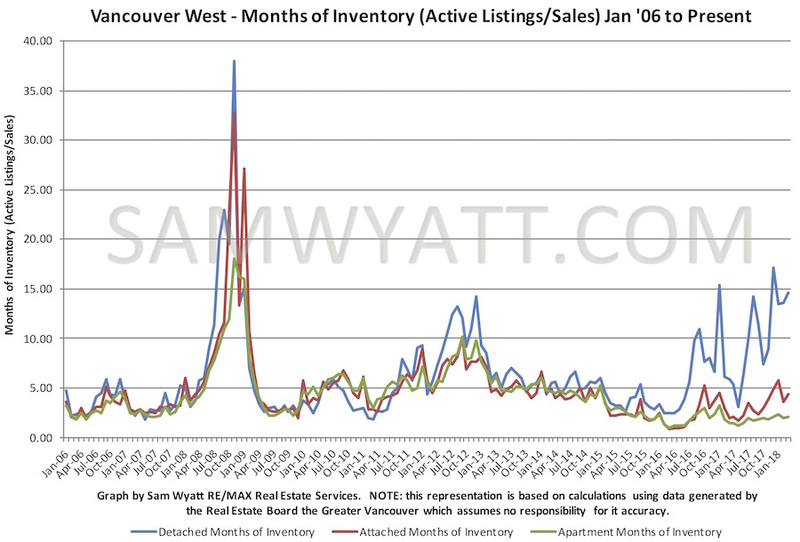 *Months of Inventory (MOI) is a measure derived from the number of active listings during a given month divided by the number of sales that month. It indicates the theoretical length of time it would take to sell all of the properties on the market if nothing changed. Historically, 0-5 months of inventory has generally implied upward price pressure ("Seller's Market"), 5-8 months of inventory has indicated a flat market with respect to pricing ("Balanced Market") and over 8 months of inventory has, for the most part, precipitated downward price pressure ("Buyer's Market").